Invoice, quote and collect payments with ease. From creating invoices to adding products and clients to setting up online payments, every aspect of Flare Invoice is designed to make invoicing quick and hassle-free. Quickly create invoices and quotes and deliver to clients by email, PDF or print. 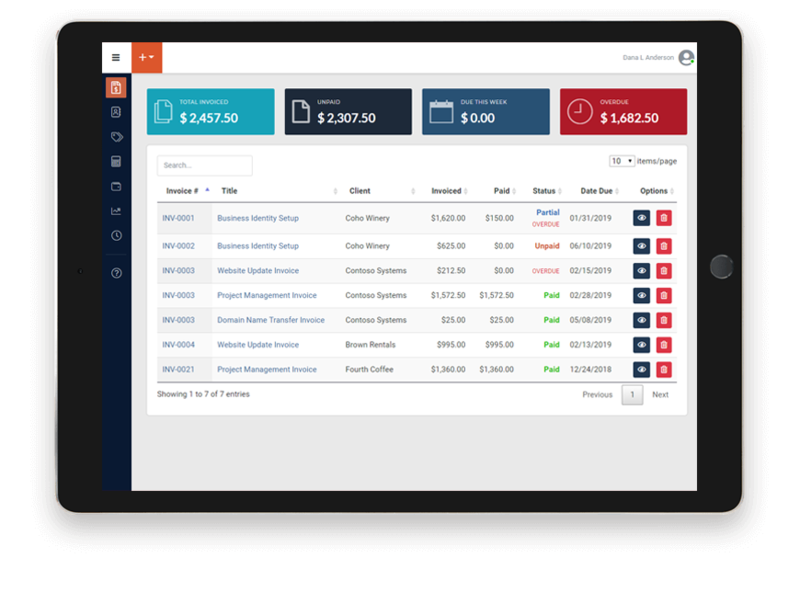 Manage your products and services, tax rates, discounts, and more for even smoother and more efficient invoicing. Rather than waiting weeks for a check in the mail, offer clients (and yourself) the convenience of online payments. Further improve cash flow by allowing multiple payments, and sending payment reminders. Know where your business stands with our growing list of stats, sales and history reports. Easy to access, and even easier to understand. No more waiting for checks to arrive. Accepts a wide variety of payment methods. Immediate funds availability. Smooth checkout process. All major credit cards accepted. Here's some quick answers to frequently asked questions. Short answer: Simplicity! Our invoicing solution is designed specifically for freelancers and entrepreneurs who need simple invoicing without all the complexity found in other accounting and invoicing solutions. No need to familiarize yourself with accounting terms or trying to figure out what's a credit memo, transaction journal or chart of accounts. 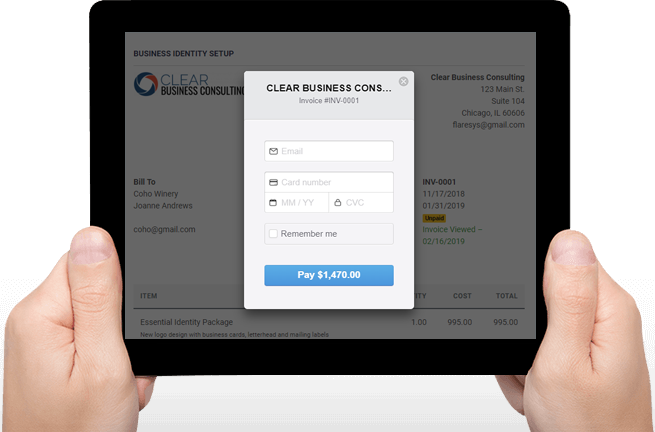 Just add your clients, set up your products and services, send invoices and receive payments. Everyone starts with our free plan. There's no expiration, so if the this plan satisfies your needs, feel free to continue using it. If your needs grow beyond the limits of the free plan, you can upgrade to our Basic Plan ($9/month) or Pro Plan ($15/month). See pricing details above for more information. Are all features available on my mobile device? While most features that work on your desktop will also work on your mobile device, there may be some limitations imposed by your device or platform. The most notable limitation is that some platforms may not allow you to upload and attach certain documents to your invoice. How Secure is This Website and My Data? Nothing is more important to us than the safety and security of your sessions and data. This is why we've taken steps to host our website with a reputable, well-established web host that employs both technological and physical security measures as well as employing the use of SSL encryption throughout your entire visit, encrypting all sensitive data and ensuring that no one has access to our website, data or users unless authorized and absolutely necessary.